Black Panther-what do u know about him? From the moment that Michael Eric Hill was born, he was different. Brooklyn hospital doctors told his parents that he would only live three weeks. A thyroid condition his mother had was believed to have been passed along to her son, but Odie Hill had faith. She not only believed her son would survive after spending three weeks hooked up to tubes in the hospital, but being a deeply religious woman, she also believed her son was meant for nothing less than greatness. Raised in the neighborhood of Fort Greene, Brooklyn amidst such artists as Spike Lee, Chris Rock and Rakim, Michael was surrounded by an undeniable energy that he could not escape. At an early age, hip-hop not only found its way into his home, but into his blood. Throwing concerts for his toys by gathering them around the portable turntable in front of his Spiderman poster in the living room, young Michael would play a mixture of songs by U.T.F.O., Roxanne Shante, Rod Stewart and Rick Springfield. This varied selection of records would stay with him and help him develop his production and deejaying style in the future. However, it was not until the day his brother brought home the Run-DMC record “Sucker MCs” that his life forever changed. Michael Hill later took on the name DJ Black Panther and began releasing Monthly underground hip-hop mixtapes at a time when independent music was not at the forefront. He was determined to carve his own path in the music industry. DJ Honda took notice to his tapes and started buying them directly to sell in Japan, furthering Panther’s name as well as his brand. After the release of a double mixtape, Panther had enough money to buy what would become his production weapon of choice, the MPC 200XL. In 2003 Black Panther put out his debut album “The Darkest Night Ever” on Third Earth Music. All 17 tracks received nothing but positive feedback and publicity from his fans and critics. The well-known website www.Allhiphop.com featured him in the “Breeding Ground” section and Elemental Magazine, Urb, XLR8, www.undergroundhiphop.com and more all agreed that a fresh new talent had emerged. In 2005, after getting back behind the turntables at clubs Panther hit the studio to work on his sophomore album, “My Eternal Winter”. The project proved to be not just a follow up, but also a step above. “My Eternal Winter” has generated a lot of buzz for Black Panther through reviews and interviews from around the world. The second single from “My Eternal Winter“, entitled “The Half“, featured Grammy Award winning songstress Maya Azucena and peaked at the number 2 position on the internet music charts. Also with the release of the album, “My Eternal Winter” Panther started his digital music label Manekinekopro, which has released music from Respect Tha God (Perverted Monks, Jeru, Afu-Ra). Respect single “I Rap 4” recently topped the Charts on all the industry gauges (Rapattacklives, recordbreaker.com), Heatmakerz latest Release “Ra Jah Ru meets The Heatmakerz” also found a home on Manekinekopro. And most recently Manekinekopro records has been responsible for the ReEmergence of the legendary emcee NINE (Whatcha Want, Make or Take). Panther released “Shots Fired” by NINE(Brand Narcotic/Manekinekopro). However, do not get it wrong Black Panther is still very much a recording artist and he is Hard at work on his third offering entitled “The Soul Eater”, pack with surprises and his ever-evolving sound. The future holds many musical endeavors, and you may ask what is next? A full-length album with the Grammy Award winning singer Maya Azucena will be a great start. “Africa’s Son “– Contro Versy – Produced By Black Panther (2009) . So enjoy this video so watch out the new single drops on halloween and The new album is dropping in November 2011 Stay tuned and support good music because it supports you! 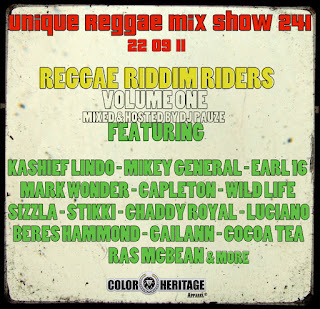 BELOW IS THE LINK TO LISTEN TO SHOW #241 RIDDIM RIDERS. 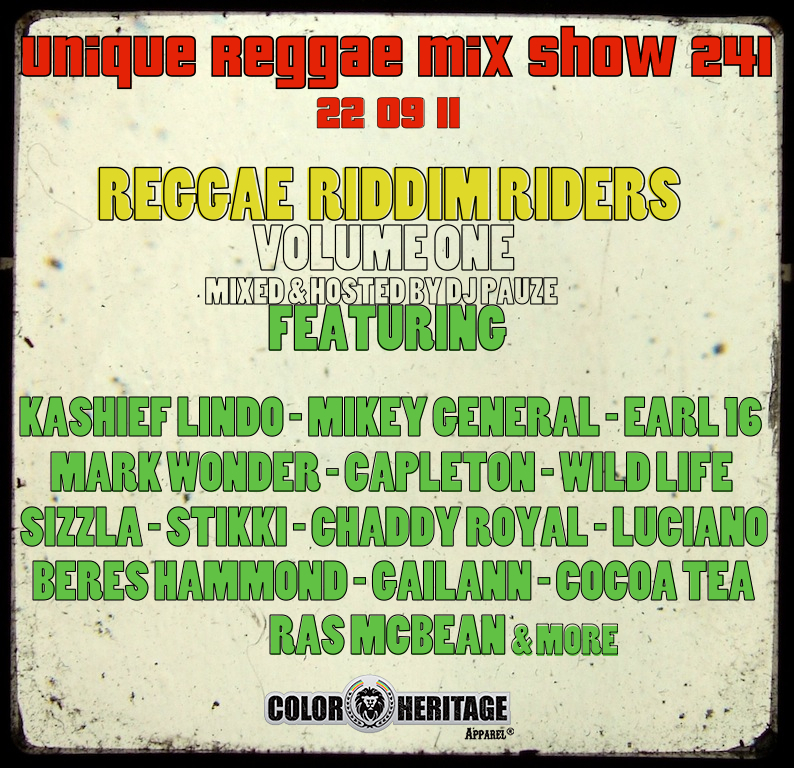 7 Reggae Downloads still available link below. Ishe + Hezekiah are an experimental soulful duo composed of singer/songwriter ishe' from san diego and producer/emcee/songwriter hezekiah from philadelphia. two unique artists with an unspoken understanding of music provided the perfect ingredients. a mixture of organic classic soul, a slight touch of electronic flourishes; a beautifully-composed sonic stew with a traditional hip hop edge. timeless. they first started working together in 2007, after discovering they shared a rare musical chemistry, which led to many collaborations and features. for their debut album. her hypnotic & sweet dreamy vocals over his head-knoddin' beats spawn something organic and ultra melodic. together their sound is raw and intimate ... pretty and gritty ... unorthodox and out the box! with subject matter that covers the spectrum, ranging from social issues, love, drugs, depression, make ups and break ups... this project is something ishe + hezekiah are both proud of, and i'm sure you will be too. iSHE's voice and Hezekiah's production go together like milk and cookies, and their Project has the makings of an equally tasty treat. iSHE slinks over old-soul samples, handles herself nicely atop hip-hop beats enjoy the two videos you gonna love these Tha General salutes all u music lovers..
LIFESIZE MIRROR, the title of Monet’s upcoming project is scheduled for release by the Purpose Music Group through Nia Distribution on Sept 27.LifeSize Mirror makes a bold revealing statement about how profoundly life’s journey has touched her. The thick, golden brown locs that once graced her crown – very much the signature image of her debut release ESSENCE six years ago - are gone. You almost don’t recognize her. But that unmistakable voice buried deep in her chest, almost as if coming directly from her heart is ever present. Her flute that teases and soars, bouncing in the air like a wondrously, hypnotic tribal spell – is pronounced, only finer, richer and more knowing. This couldn't be more evident than in "VAIN," which uniquely combines jazz,classical and instrumental soul " VAIN" is an account of a reflective journey - Monet’s flute like a snake charmer, beautifully intricate which starts out with moments of calm, coaxing gently until it deepens to a throaty rasp, becoming more complex and intriguing. Monet’s musical repertoire is diverse with influences drawn from jazz, soul, latin, classical, folk, house and funk. Fundamentally, however, her sound is purely rooted in organic soul. The influences are a glorious amalgamation of Marvin Gaye, Joni Mitchell, Bob Marley, Sade and Hubert Laws. Surrounded by multiple genres of music by both parents - her mother a doo-wop singer and her father a manager of jazz and Latin artists. Monet's - musical roots run deep. A little known fact is that she was accepted to the prestigious Cornell University at the tender age of 14 on scholarship due to her advanced musical proficiency in classical flute. Monet also plays guitar, oboe , piccolo and piano. One would be remiss not to mention Monet’s various film credits including acting and directing. This is a resume full of aesthetic discovery. While in between projects, leading up to the actual production of LIFESIZE MIRROR, Monet was quite busy at work fine tuning her craft, contributing her signature flute work, songwriting and vocals to recent projects by Angela Johnson “That's Just The Way"( which is also on Lifesize Mirror) , Nigerian world soul artist Siji "Fantasy" and "Ekundayo,” and singer/songwriters Kendra Ross "Has to Be,” and La Sonya Gunther, " How we Livin." Monet is involved in upcoming projects by Abby Dobson "Fly," Tarrah Reynolds and Collette. Monet also contributed to club hits by Melena Perez, "Confession,” and Tortured Soul, "Don't Hold me Down,” flute and vocals respectively. LIFESIZE MIRROR promises to be rich with what we expect from Monet. However some surprising alternative twists to her sound abound. There is more orchestration in the arrangements, and the addition of violin, cello, trumpet and soprano sax on various cuts are welcome. Her reggae dub influence is present on, “Ever Want.” Then there’s the Monet that many are definitely familiar with in “Hold me Sweetly,” a quivering ode to desire that Monet admittedly calls baby making music. Other cuts from this effort seem to convey odes of promise, hope, inspiration and transformation like “Walk with Me,” and “It’s Your Life,” which is an anthem to one being a master of one’s own destiny. Jeff Smith (Family Stand), violinist Tarrah Reynolds, keyboardist Nick Rolfe, vocalists Tricia Angus, Saundra Williams, Martha Redbone, and Abby Dobson, are all contributors to LIFESIZEMIRROR. The producers of the project include Steve Wallace, Angela Johnson, Sijii, Prez, Jesse Fischer (Soul Cycle),Ticklah and Ethan White (Tortured Soul). Monet is an explorer. Through her musical expression we witness her seeking the highest level of self awareness and realization which is often referred to as LIFESIZE MIRROR. I n this project she freely moves through her existence fearlessly, balancing both the pain and the pleasure, the heartache and the rapture making sure we feel it too, spiritually, intellectually and physically. Conveying this is no easy feat – and as we bear witness to Monet’s creativity as she continues to document her journey through her music. We know that we’re all the better to be an audience to such a gift.